I’m stuck in the city this weekend with time to shoot. Anything cool in the tri-state-ish area that I can’t miss? I’m open to suggestions. As you can see from the pictures, it could be sports, dance, cultural….it just has to have some obvious visual elements that I would be able to shoot? Waiting to hear from you, Philadelphia! Waiting to hear from you, Boston! Waiting to hear from you, Princeton! Hanami at Brooklyn Botanic! It’s the official Cherry Blossom festival! There’s all “Rampage” – a celebration of…..ramps (the vegetable) – at Union Square on Saturday….But somehow I think Hanami will be more breathtaking. I was going to say he Cherry Blossom festival! It’s supposed to be gorgeous, and it’s going to be beautiful outside this weekend! Have you been to Storm King? I’m going next weekend, but I’ve been wanting to go for ages now. Can’t wait to hear what you end up doing. Go check out the Cherry Blossom festival this weekend in Brooklyn. 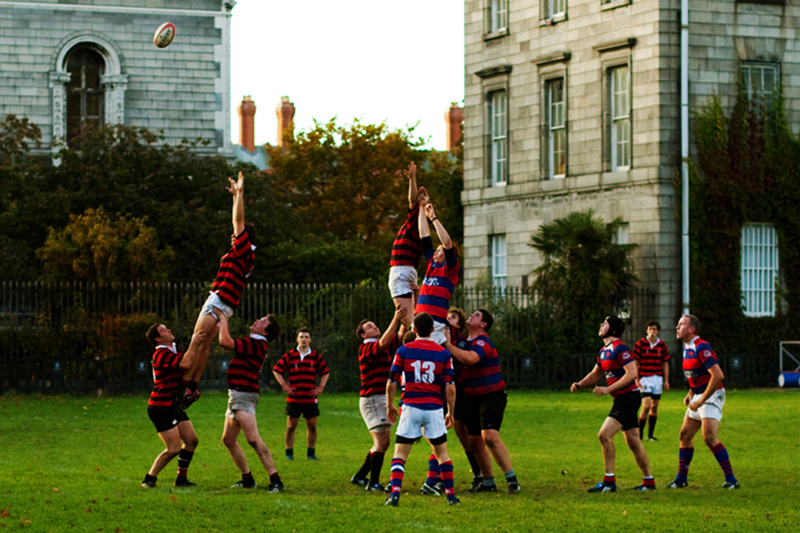 But that rugby is in Dublin, at Trinity College — the undergraduates would be delighted to know they are included as tri-state(ish). i think Scott wants to go to Philadelphia. I saw the picture and thought you were in Dublin and I got very excited. Perfect photo and than I am waiting for pics from Philadelphia. Have a great friday. art all night is going on saturday at 4pm to sunday at 12noon in PITTSBURGH!!!!!! That looks like Trinity College Dublin? gorgeous picture! have a fantastic weekend! The first photo is radiant, the light fantastic. The colors are saturated and attract the eyes in every part of the picture, every corner. Great shot ! Rutgers Day is this weekend. There’ll be yoga in the park, go kart racing, yummy organic foods, and many more activities! Plus, it’s closer to NYC than Princeton or Philly. Spring weekend at Yale University. This time of year the campus is absolutely brimming with energy (great weather, end of term), on top of the world class architecture and galleries in town. You also might catch the rugby alumni weekend in action as well. Lot of good stuff to see (and the world’s best pizza) up there. Also, the Hester Street Fair starts this Saturday. Go to Philadelphia! I am from there and would love to see some street style from Center City. Tough Mudder! First weekend in June in Philadelphia! Seriously this is an AMAZING event don’t miss! Independent experimental theatre in Brooklyn this evening. how about you take your talents to a place that’s usually suffering for some style. go to hoboken or newark or something. or sunnyside. or go shoot airport workers at LGA. I agree with the previous post that you should get out to the Brooklyn Botanical Garden for the Sakura Matsuri this weekend in Brooklyn. Shad Fest in Lambertville, NJ! It’s going to be eclectic and so much fun! I have no idea about what’s going on in Boston (I’m a grad student, we not really allowed to leave the house) but since this is the first nice weekend post everything that happened, I can promise you that people in Boston are going to be OUT and they’re going to be DRESSED! We like to celebrate our Spring! A rowing regatta is happening in Princeton this weekend. Would be a good opportunity to shoot both athletes and the Ivy League prep crowd. Yale, Harvard, and Princeton will all be there. In addition to Communiversity, the Princeton Glee Club is performing this weekend in Alexander Hall (which is a spectacular venue), and DiSiac Dance Company is performing in Frist. Also, today (Friday the 26th) is an Earth Day celebration with appearances by eXpressions and Body Hype dance companies, as well as a capella and improv comedy. Its spring in Burlington, VT. COME ON UP! Princeton’s Communiversity! The whole town and university community will be there. There will definitely be some amazing style at the BK Flea this Sunday, on the Williamsburg waterfront! Not to mention some bangin’ lobster rolls. Princeton is so lovely this time of year…all the trees are in bloom and the students are out enjoying themselves. Echo the Communiversity statements above, it is pretty fun! You have to stop by Penn Relays!! Plenty of action to shoot, and arguably the biggest track and field event in the US. College races + Olympic trials + fashionable students and fans from around the world. I agree with Nia! Penn Relays will make for some great shots! Spectators and the actual track and field events! Many of the people that attend have made it an annual tradition and have been going for many many years! Can’t wait to see some photos! Scott, how about San Francisco? It’s closer than Milan or Paris and you have a lot of fans in the SF Bay Area. There’s all kinds of great things going on in Philly this weekend. There’s the PIFA street fair down Broad Street, the East Passyunk “Flavors of the Avenue”, Science Festival wrap-up… plus the weather is supposed to be just perfect. http://www.uwishunu.com/ is a great source for all things happening in Philly. Haha … didn’t see your comment and just wrote about the same. Yay Philly!! Also, the Philadelphia University fashion show is on Saturday, which is at a theater that the street fair will be in front of, so you can go to both! Just want to second (or third, or fourth, or fifth) the Princeton Communiversity suggestion. Also, campus is beautiful at the moment thanks to flowering trees everywhere! This weekend is the opening weekend for the RISD exhibit Artist/Rebel/Dandy in Providence. There will be a tweed ride on Sunday. How about an incursion into Amish country? It’s free, there will be performance stages popping up everywhere, and Matt Damon is the guest of honor/awardee of honor. There’s a soul/motown band tonight 5pm-7:30pm by the Science Center plaza, introduced by Matt Damon. Lots of dancing to be expected! Macklemore concert at MIT (in Cambridge) tonight. What could be more fun to shoot than 1000 self-professed nerds in concert gear? Hello, pocket protectors and daisy dukes!! East Passyunk Ave in South Philly (awesome food, drink & retail street http://www.foodandwine.com/articles/philadelphia-east-passyunk-avenue) is having their Flavors of the Avenue event. Eat great good, have a drink and shop a little. My university is having its annual fashion show for the graduating design class here in center city Philadelphia. Boston College is having its annual Arts Fest this weekend! It’s just outside of Boston, in Chestnut Hill. Come to Philadelphia! I’ve been dying to see pictures of my home city on this blog since I started following! Wherever you go this weekend, I’m sure that with your photographic camera and your smart taste you will catch the essence of beauty! The Philadelphia International Festival of the Arts (pifa.org) is having a street fair on Broad Street in Center City Philadelphia. Passyunk Square (South Philly) is also hosting Flavors of the Avenue – a food event on the street that was recently voted one of Food and Wine magazines top foodie streets in the country. I agree, Princeton in spring is beautiful, but why dont you head to Philly on Mothers Day weekend for the 78th Dad Vail regatta. Epic rummage sale at Trinity Church in Princeton NY on Saturday! Boylston St. in Boston is PACKED! It will be happening all weekend! Boston Strong! Ireland is clearly on your mind, perhaps a little trip to Dublin would be just what you need!! Come to Philadelphia for some interesting sporting events! I also suggest an organization I just learned about, The Athletic Baseball Club of Philadelphia (www.phillyvintagebaseball.org). They belong to a league that plays baseball 1860s-style and it looks like a lot of fun. It seems they have an away game this weekend, but maybe you can catch them another weekend. They’re old-timey! Artist/Rebel/Dandy party at RISD Museum of Art. Tomorrow night is the party! Providence, RI! The Cherry Blossom festival at the Brooklyn Botanic Garden will be beautiful. Hey Scott, What a beautiful day for AG Day and Art In THE GARDEN at the University of Delaware in Newark Delaware. Boston is beautiful right now. You could come check out the site where the bombs went off, it’s emotional and also uplifting to see Bostonians remember what happened. There’s an outdoor fashion show in Harbor East of Baltimore this afternoon! Plus, it’s homecoming (lacrosse) weekend at the Johns Hopkins University. Why don’t you stay in NYC? Columbia University Campus on 116th str. is full of life and interesting people on sunny Sundays! You should stay in the city! Sunday is the 5 Borough Bike Ride. Over 30,000 bikers going down a closed 5th Ave. If you’re in Boston on the first Friday of any month, it’s a great time to see the art scene at SOWA in the South End. Otherwise there’s also a vintage and farmer’s market there with lots of wonderful and interesting folks every Sunday! You could almost duplicate this scene at Franklin Field at the University of Pennsylvania in Philadelphia. For similar athletic events, try Van Cortland Park in the Bronx, on any Saturday afternoon. Or bette midler’s boathouse on Spuyten Duyvil.